The downside to being a full-on gadget anorak and lover of boys-toys, apart from getting daily emails about the latest toys and ‘tech’ which force one to go to the associated website, drool over one’s keyboard, and make man-to-man noises to other men in the office with similar afflictions, is being putty in their hands. The b’stards. I’m talking about sites like Big Pockets, Scan, I Want One Of Those, Firebox, etc., etc. Hey, if you’re a real man, you know exactly what I’m talking about and where it is on the ‘net, right? Ok, assuming one literally knows how to resist ‘wopping’ out the credit card and signing up for ‘one of those’, the temptation to give in to the boy-toy magnet is far greater than any women would ever appreciate. It’s far far stronger than the woman-magnet to shoes. Oh, and handbags. Far stronger. But we can handle it. An essential aspect of guilt-free boy-toy buying is that they have to take forever to be delivered. Ideally, they need to be delivered to a place of work so that all the other men can stand around salivating whilst they are being ripped from the packaging and batteries thrust in and switched on without checking the instructions. It is imperative not to wait to read the instructions, not even if the boy-toy doesn’t work. This allows male bonding to take place as ideas are floated on how to make it work and what to check. Once the boy-toy has started working, it is important that the other men wait in the correct pecking order to ‘have a play’ with the boy-toy. During this period the alpha male (the purchaser) is allowed to read the instructions, store hints and tips inside his head, but not share them with the lesser males. Then he can demonstrate his extended knowledge when it comes to his turn to play again. Finally, it is most imperative of all that the boy-toys break and be beyond repair within 10 working days. The final journey to this death can include the extensive use of staplers, blue tack, super glue, paperclips, sellotape, and gaffer tape in order to effect manly but temporary repairs along the way. Any man who still has a fully-functional boy-toy after this cut-off period is so damn gay, ok? Typical boy-toys that hit high on the success list are things like remote control helicopters, which are guaranteed to break the same day. So then, back to the main thrust of all this. The canny folks behind Big Pockets have a brilliant way of getting rid of stuff that just won’t sell, or there weren’t enough real men to wop their credit cards out for. True, a lot of what they have left over are totally pointless connector leads, replacement leds, or chips that don’t fit into anything that currently exists, or enhancements or spares, like helicopter skis or rotor-blades, made for boy-toys that have been long thrown away. But, none of that is important, ok? Men don’t care. Yep, they certainly know how to target and sell the stuff nobody actually wants. They bundle all this rubbish together and call it a “Bag o’ Crap”. In their small print they say it’s a bag o’ crap. They explain to the men likely to purchase it that it’s a bag o’ crap. They add the ultimate man-magnet element of refusing point blank to say exactly what might be inside a Bag o’ Crap, and that each one is different, but each one costs £4.99. They hint that the total value of everything inside will exceed the £4.99 price, and there should be at least one thing that the purchaser will enjoy. Aha, all bases of objection from a man trying to resist the magnet are covered. £4.99 is a perfectly acceptable price for complete rubbish. Ask any man, he’ll agree. The added excitement of not knowing what crap is arriving for the £4.99 outlay makes the whole experience like man-Christmas. Tearing the wrapping off is even more exciting. Identifying the contents is an essential part of male bonding, and the whole process can be so exciting for the less experienced men that they let out a tiny bit of wee (NB This is never spoken of, but very common). So, once again, Big Pockets, you utter utter b’stards, congratulations on your latest perfectly targeted man-trap, the Bag o’ Crap. Please hurry with our deliveries. There’s a lot of men here (some who, it has to be said, have ordered more than one Bag o’ Crap) pretending they’re not excitedly watching for the delivery vans. Previous Post: Whatever happened to the ozone layer? Next Post: Which way is the bus going? Now called a Trolley of Tat at BigPockets! Heh! And, you can pay for a FIVE item one as well as a three item one. Very tempting. 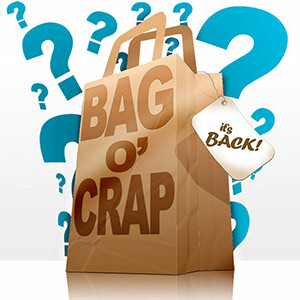 They've been 'Bag o' Craps' forever, I can only guess somebody objected to the word 'crap' or something. Mental! Never bought anything off them, almost did buy some nifty powered speakers, but didn't in the end. Maybe they are in the trolley of tat? It's thinking like that that forces you to part with £4.99, only to then be disappointed!